At 6 Degrees, we select our hero images with care. Partly, we’re aware of how often we deploy this photograph during the months leading up to September, and how naturally it comes to frame the emotion of 6 Degrees Citizen Space. Partly, too, we’re in agreement that great photos appeal to core aspects of human nature. They help us to process experiences and headlines, and can move us to action, or at least to empathy. Qualities of composition and colour and lighting matter, of course, but in the end it is the story that is most powerful; the narrative that is indelible. In 2016, we were lucky to secure the perfect image for our then nascent project. 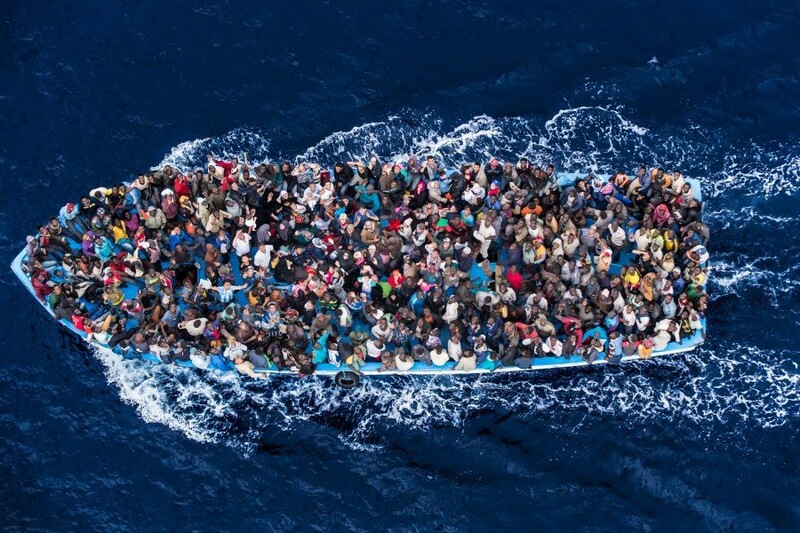 Massimo Sestini’s Mare Nostrum is a brilliant photograph – urgent, unsettling, hopeful, dignified, and humane. Though it spoke forcefully to the refugee crisis, for us it spoke most eloquently, and stirringly, about the people involved in this global drama. Even the arrow shape of the prow and the wave action felt significant. If an image could be so evidently alive and directed, so could be our debut Citizen Space. For 2017, we knew we wanted a photo the equal of Sestini’s in story and feeling. We also wanted to get closer to the real people behind the drama. Given our themes of Walls, Bridges, and Homes – themes indicating much movement and disruption – we thought it best to move the visual narrative to land, to suggest a transition and a still-unfolding story. Should the image be of a camp in the Middle East? Or maybe something from this side of the ocean: a scene at the wall separating the U.S. and Mexico, or a furtive winter border crossing into Canada? We spent contentious hours at the task. Then we came across Antonio Masiello’s stunning Hand of God, and could not look away. It shows an overcrowded boat attempting a clearly difficult landing. Some refugees have already crossed safely to shore; others are still in the vessel, awaiting their turn. 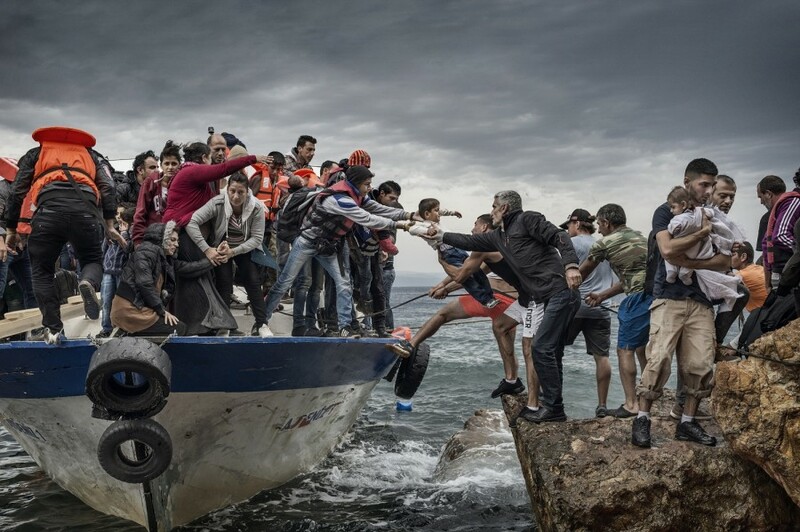 At the centre is a child being passed from outstretched arm to outstretched arm across an alarmingly wide gap between the gunwale and a cement seawall or jetty. Falling into that gap, with the risk of the boat lurching closer to the seawall, could be fatal. The photo is dramatic, to say the least, if only for the determination on the almost two dozen faces captured by Masiello in the full frame – one of which breaks the anonymity by directly gazing into the lens. These people have already been through so much, and yet so much more tribulation, it is clear, remains. As well, the image intimates the thematic arc of 6 Degrees Citizen Space 2017 and extends the visual emotional connections first made last year – a closer look at the urgency, and the hopefulness, and the humanity. But still we hesitated. Hand of God struck some of us as being almost too beautiful – nearly everyone remarks on its resemblance to a painting by Michelangelo or Francisco de Goya – and too staged. We decided to find out more about how the photo was taken. Masiello was on Lesbos to document the crisis. He learned of smugglers who were landing boats in remote coastal areas to avoid being caught, putting the refugees in yet further peril. On coming upon the scene in the photo, Masiello recognized the immediate danger of the situation. He snapped just a few images in a few very real seconds, and then joined those on shore in helping people disembark the vessel. That was more than enough for us. We had our focal image for 6 Degrees Citizen Space.